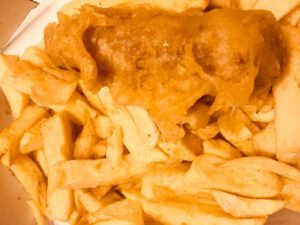 New Vegan Chippy in Exeter! 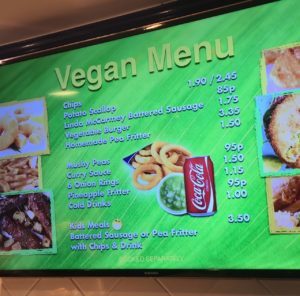 We were very excited when we heard about the new vegan menu starting at a chip shop not far from us in Exeter. We got even more excited when Cameron, the owner of ‘Fish & Chips at Polsoe Bridge’ let us tuck into some battered vegan sausages and chips on launch night this March. So the chippie is serving their new vegan menu every Wednesday evening between 5 pm and 10 pm. It includes chips, potato scallops, Linda McCartney battered sausages, vegetable burgers, homemade pea fritters, mushy peas, curry sauce, onion rings and pineapple fritters. I celebrated my 6 year veganniversary this month so I’d not had chips from a chipshop for a long time! As this chippy is cooking the vegan products separately in new oil, we had no worries about accidentally eating little bits of fish that get scooped up with the chips. We had the Linda McCartney battered deep fried sausage and chips and we were very impressed. The batter on the vegan sausages was crispy and plentiful and it’s a great new way to have a Linda Mac banger. The chips were delicious, cooked to perfection and well….my kids keep asking when we’re going back again so I think they were happy! 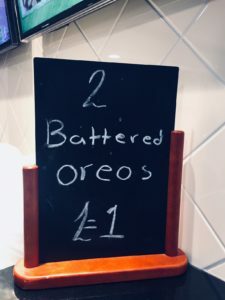 We all want to try the battered oreos next….! Yum. A large chips and a vegan sausage is £4.20 so a pretty affordable vegan junk food takeaway treat I’d say!!! 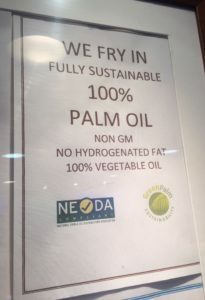 I also noticed they do a gluten free menu another night of the week and only use fully sustainable palm oil. It was jam packed the night we went which is surely an indication of a well loved eatery. Thanks to Cameron and his team, we’ll be back soon. Don’t forget to leave your own comments below on what you think of the food there. We received meals in return for this review but we must stress these opinions are 100% our own. If you liked this then please subscribe to my newsletter for news on new vegan products, competitions, giveaways and discounts. If you’re looking for more money saving and cash creating ideas – join the friendly Super Savvy Vegan Facebook group. I’m also on twitter and Instagram. Next post: Save hundreds on your shop! I was very impressed too on their second Wednesday. I had two sausages, chips and a pineapple fritter. My friend is not vegan or vegetarian but won’t eat meat sausages so was excited to join me and couldn’t have been more complimentary. She reckons the vegan curry sauce is far better than any curry sauce she has had before. I did ask about the oreo’s but the ‘server’ didn’t think they were vegan as not on the vegan menu and was a new member of staff so I gave it a miss but perhaps Cameron can confirm whether ok or not ……..
That’s great to hear your friend liked it too, I’ll check with Cameron about the oreos and let you know. Obv oreos are vegan so hopefully they’re fine!? Oh my, this sounds fantastic. What about us gluten-avoiding vegetarians? Do you only do gluten free on a Monday? Do you only do Linda McCartney on a Wednesday? Like, could I have a veggie sausage on gluten free night? Do you know if the sausages are gluten free? I’ve not had these before. Sorry to sound a fussy eater! I’m not fussy, just wonder about whether a totally GF veggie could be catered for at the mo.